The Global Azure Bootcamp 2018 in Belfast was part of a worldwide meetup for experts in Microsoft Azure technology. With 284 events taking part across the world, from Australia to Brazil and everywhere in between, it was a fantastic opportunity for specialists and beginners to come together to learn more about Azure. Automated Intelligence was there to demonstrate our expertise in Azure cloud management. 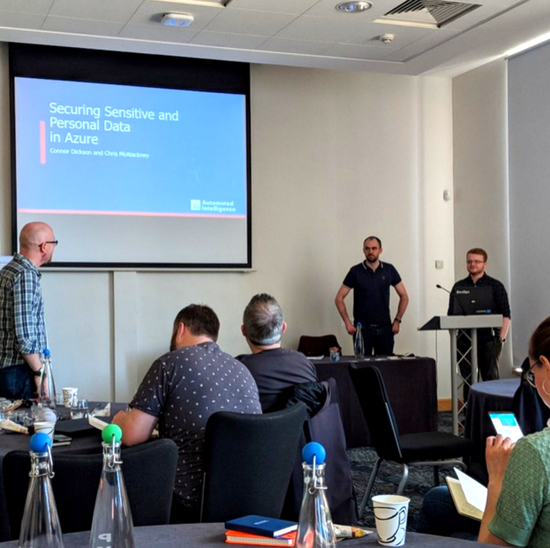 On Saturday 21st April, Azure enthusiasts gathered at Riddel Hall in Belfast to take part in a host of hands-on Azure based activities, knowledge sharing and talks. The day itself challenged beginners and experts alike to experience the far-reaching capabilities of Azure. As specialists in Azure, our team was invited to demonstrate our knowledge and experience in data security. Chris McAtackney and Connor Dickson, our resident Azure experts gave a talk called “Securing Sensitive and Personal Data in Azure”. The aim of this talk was to shine a light on some of the challenges and common objections to working with Azure, especially when it making sure sensitive and personal data are stored securely. Chris and Connor offered their unique insights into how AI has worked closely with Microsoft to address these concerns and demonstrated how we are to offer a viable and secure solution to our customers using the wide variety of powerful services and capabilities within Azure. The talk also featured a deep-dive into the code behind one of our solutions, offering attendees a chance to understand how we use Azure to solve the real challenges faced by our customers. When it comes to working with Cloud technology, the Global Azure Bootcamp was the perfect opportunity to reach out to fellow enthusiasts and demonstrate the power and capability of Automated Intelligence’s Azure based solutions. If you’d like to hear more about how our products are designed to protect your company’s sensitive and personal data, get in touch today.